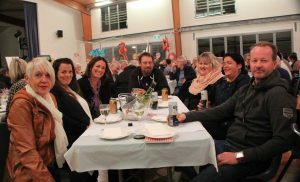 The second Bush to Beach Gala, held at the Rainbow Beach Community Hall last month, was a huge success. The freezing weather didn’t stop them. By bus, car and foot they came, nearly 200 of them. For a night of feasts, magic, music and comedy, they ate, they were amazed, they danced, and they laughed. Best of all, they donated, they haggled, and they spent! All for one reason. To get a group of kids, living way out west, who they have never met, here to Rainbow Beach to get away from the drought and experience things they couldn’t even imagine. With lots of speeches, songs, auctions and alcohol the generous people of the Cooloola Community managed to raise near on $30,000 to make this dream a reality. Of course, none of this would have happened had it not been for the tireless efforts of Tony and Rosie Stewart. With the backing of the Lions Club of Tin Can Bay, Tony managed to once again give everyone a great night out and coerce them into digging deep for a wonderful cause. “First off the food was fantastic, Sean did a great job,” said Tony. “I would really like to thank him for all the hard work he put into the night. Plus I have to acknowledge the huge effort of the three girls who worked the bar all night and then collected plates and cleared the tables – Laurel, Kirstie and B.J, thank you so much! “Rodney was unreal, entertaining us again. He had everyone in stitches and had most people up on their feet dancing the night away. “Mostly I would like to thank the sponsors and of course the folk who attended on the night and gave so much, thank you everyone,” continued Tony. Tony, if it wasn’t for your kind and generous heart, none of this would have happened so, thank you! I am sure there are one or two kids that will thank you too!